Once registered (it only takes a few seconds to sign up), pick some items from our site and advertise them online, either on your own e-commerce website or on eBay, Amazon, you can even sell them through the small ads section in newspapers. You can use our images and descriptions either by saving them one by one of using our product feeds. When you make a sale you come back to our site, log in and place the order with your customer's details as the delivery address. We charge you the dropship price and ship the item directly to your customer. Your customer will think it has come from you and you will have made a profit risk free! Register now to open a dropshipping account and gain immediate and full access to our dropshipping range. The prices can only be viewed once you have registered which is quick and FREE. Once in you can view all the prices. We calculate the prices by adding 12% to our standard wholesale prices. Some customers ask why the prices are more than wholesale? It's important to us and for you that your package arrives on time and in perfect condition. We appreciate that through many services you rely on positive feedback so we take extra time to check your orders. As we deal in smaller quantities on Dropship orders compared to Wholesale orders, we use extra packaging to ensure things don't break en route to your customer. The extra time and packaging used is our handling cost. This part of our service is designed to take all the hassle away from you so all you have to do is set the prices and sell your items, we do the rest. Please note, unless clearly stated the price you see on the website is for one individual item even if multiple designs are shown in the image. If a product is sold as a set it will clearly show in the title of the product. We sell lots of products where there are multiple colours or design available but the price is for 1 single line. All our product and postage prices are ex vat. VAT is added to the whole basket during checkout. As we are based in the UK VAT is chargeable on items sent to the UK and EC countries. If you are based in the EC and have a valid VAT number you can enter it in your account and you will not be charged VAT when sending goods to the same EC country as your VAT number is valid in. If you are sending to another EC country but you do not have a valid VAT number for that country then you will be charged VAT. This excludes the UK. The table below gives you full details, but if you have any queries please contact Customer Services. Puckator charges VAT to Dropshipper? When you enter a VAT number it will automatically send us an email and we will verify it. If it is not valid we will contact you. VAT on postage. We are asked why we charge VAT on postage when royal mail is VAT exempt. Although our shipping prices are based on royal mail, the shipping charge is the cost of postage including the cost of sending it via dropship, so it includes the cost of packaging, labels etc, it is not just the postage cost, it is the service as well, that is why VAT is charged on the whole basket. You can choose to sell only a few of our products, in which case you may find manually entering the product details into your website is not too laborious. However, if you have scripting experience, or have a web company developing your site for you, it can be beneficial to set up your site to use our feeds. We offer CSV and XML feeds, as well as feeds to link with Ebay Turbolister. Your website will then be updated automatically as often as your code tells it to! Please note: We are not able to set these feeds up at your end, this is something that you or your web developer must have the skill to do. Every product on the website has a stock level which is updated throughout the day. You will be able to see when products are selling quickly as the stock level will go down quickly. Whether you check the stock levels manually or use the feeds, we recommend you them regularly, especially if you are using long listings on eBay or Amazon. We are not just a dropshipper and although we do try to keep stock levels as up-to-date as possible, there are times when things go out of stock quickly or overlap on orders. When an item goes below 20 the stock level will become red, at this point we recommend you remove this item from sale. When an item goes below 12, it automatically comes off the dropship site completely. If an item goes off the site and you have sold it please contact customer services and we will try to offer an alternative. We've implemented a service when you can receive weekly e-mail updates of stock levels, which may help you when preparing e-bay auctions for example. Our product feeds will update daily so you'll always see a stock level that isn't real-time, but gives a clear indication of stock levels for everything we sell. Similarly, in the weekly updates, we make you aware of products that have come back into stock. We do this on the website already, but it always helps to have an e-mail too, but this and the out of stock option can be switched on in your account area. All of our product photos and descriptions are available for you to use whether you download them manually or with the feed. If you sell on Amazon they require barcodes against each product. This information is available when you download our feeds, click here to see all the feed information. You will need to have registered without site to see this information. On certain products, we offer a colour or design dropdown. This gives you the chance to offer your customer more choice and hopefully get more sales. If an item does not have a dropdown, unfortunately, you cannot select a design. When items have multiple designs under the one code the stock comes into us with equal amounts of each design within that stock level. This makes it difficult to pick lots of one colour, hence why if you have a customer interested in 12 or more of one specific colour or design dropdown, please contact us first. We have a dedicated team in our warehouse that deal with all the dropshipping orders. They spend extra time checking and packing your orders ready to be dispatched. We do not offer a facility to add a customer invoice in with the parcels we send, nothing is added into the box. We use a return address label tape that says 'Head Office' and then our address, it does not mention Puckator. 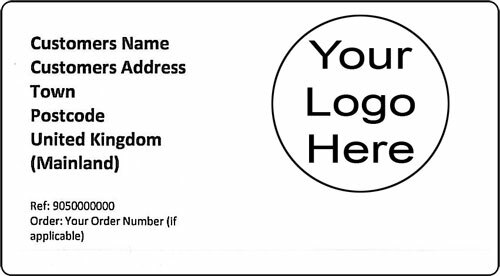 We then stick a label onto the box with your customer's address, the order reference and if you have uploaded a logo that is printed on the label as well. An example label is shown below. When placing an order there is a field to add delivery instructions. Our dropship team will then add the delivery instructions such as 'Please leave in porch if no one home' onto the box for the courier to follow. We cannot guarantee that the instructions will be followed by the courier but we will always add them to the parcel. At puckator, we have built a brand and name for ourselves as one of the leading importers and wholesalers of giftware in the UK. As such a lot of our products will have a small puckator logo or brand on the product. This is not put there to advertise our company in competition with our dropshippers as we do not sell on eBay or amazon and is there to target our wholesalers and retailers, not the direct public. The logo is small and cannot be removed before we send goods via dropship, but we do not feel it interferes with our dropshipping service. On some toys and other similar products, we are required by law to have our email address on the product but it takes customers to our www.puckator.net holding page and does not take the customers to any direct selling pages. Full Shipping and Delivery information can be found on our Shipping Page. Damages, Faulty Items & Other Queries? What happens if my item arrives damaged or doesn't arrive at all? Our after sales service is extremely important to us and we have built a strong reputation for excellent customer service on both our dropship and wholesale sites. If you have any query relating to your order the first thing to do is email us. We aim to reply to most emails on the day we receive them so if you don't hear back from us in a couple of days please email again. We are available Monday to Friday, 8.00 - 4.00, and we do prefer emails rather than calls. If an item arrives broken or faulty we do not generally need you to return it as it incurs extra costs which are unnecessary. However, if your customer receives the item and they decide they no longer need it and it is not damaged or broken then please contact us and we can arrange a return. Once the item has been returned to us in original conditions we will refund you the cost of the item, but NOT the shipping charge or cost of transport in either direction. Sales from our site are business to business. If at any point you are not happy with our service and decide you want to cancel it is not a problem, just contact customer service and we will do the rest.